I'm pretty sure I could stop right there and those two words would say it all, but this For the Love of Chocolate Cake, oh my, it is taking things to a whole other level. I first experienced this cake at a church dinner many years ago. The lady who brought it told me how to make it, but as with most things that I don't immediately write down, I forgot about it. Then I was going through some recipes I found in my mom's recipe box and I stumble across it again! I was so excited that I made it that night, and sure enough it was just how I remembered! This cake is truly decadent and it could NOT be easier! I can't wait share it with you so you can share it with your special someone this Valentine's Day! Before I get started let me explain myself. One of the beauties of the cake is that it all begins with a boxed mix. If you have followed my blog for any amount of time, you will know that I don't usually use boxed mixes, but I have tried to make this cake from scratch and it is just not the same. So, in the spirit of deliciousness, I am going boxed. You can feel free to try it from scratch for yourself, but I can't promise the same outcome. So, to begin, pour the devil's food cake mix into a large mixing bowl. Next add the instant chocolate pudding mix. Using a rubber spatula, mix the ingredients together. Now it is time to add the chocolate chips. And, using the rubber spatula, fold them into the batter. Make sure you get every nook and cranny. Pour the batter into the pan. You may need to spread it around a little with your spatula because it is a very thick batter. Next, place the cake into a preheated 350 degree oven and bake for 50-55 minutes unto a toothpick comes out clean. While the cake is baking, you can make your ganache. It may feel like it is a little too early for that, but this will give the ganache time to cool, set, and thicken making for a beautiful fudgy topping. Pour the half & half into a small sauce pan and place over medium/low heat. To the half & half, add the corn syrup. Once the cream and corn syrup mixture is hot, add the chocolate chips. Next, add the vanilla extract. Stir until the chocolate has completely melted and is smooth and shiny. Remove from the heat and set to the side to cool. Once your cake has fully baked, and you can pull a clean toothpick from it, remove it from the oven and set it to the side to cool for 10 minutes in the pan. After 10 minutes, set your cooling rack on top of it and flip the pan onto the rack. Your pan should slip right off of the cake! Let the cake cool for at least 1 hour. You want it to be completely cool before you add the ganache. Next, place the cake and cooling rack onto a baking sheet and pour the beautiful chocolate ganache over. Let the excess run off onto the baking sheet and allow what remains to set on the cake. I would say for at least 30 minutes. Look at that! WOULD YOU LOOK AT THAT!?! 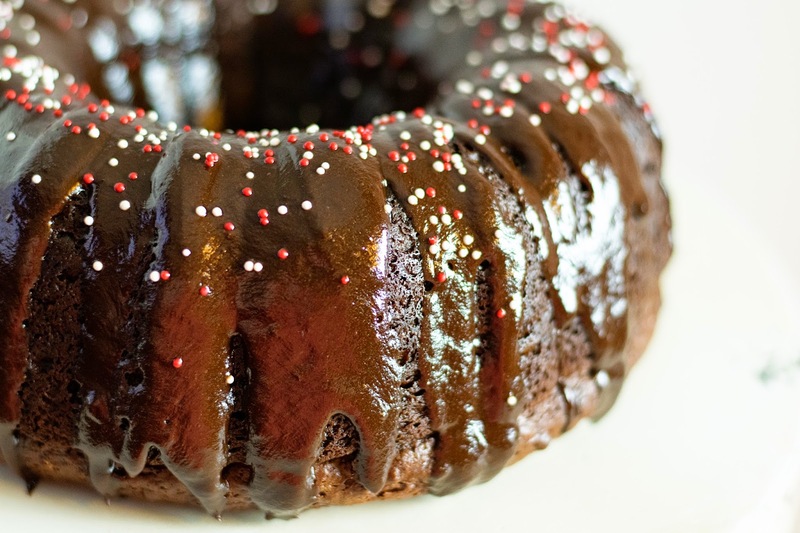 That ganache is perfectly fudgy, and shiny, and...well you get it! 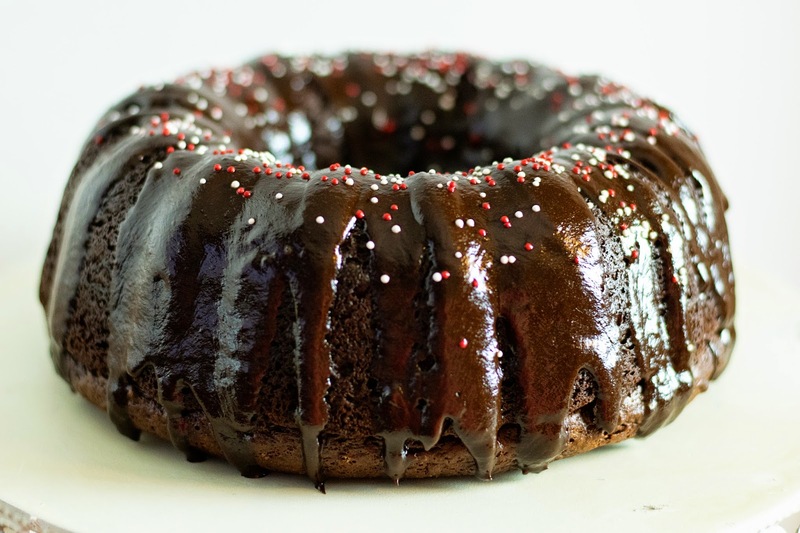 This cake (even though it looks like a donut here) is pure chocolate perfection! And when you cut into it, OH, it is so soft and moist. It is truly divine! Boxed cake mix have never looked so good! So this Valentine's Day let that special someone know how much you REALLY love them, and get in the kitchen and make this cake! It is soooooo very good! Pour the cake mix, pudding mix, sour cream, eggs, oil, & water into a large mixing bowl. Mix together using a rubber spatula. Add the chocolate chips to the batter and fold them into the dough. Pray and bundt pan, LIBERALLY, with cooking spray and pour the batter in, spreading it out with spatula. Place into the oven and bake for 50-55 minutes, until a toothpick comes out clean. While the cake is baking you can make the ganache. Place a small sauce pan over medium/low heat and add the half & half, corn syrup, chocolate chips, and vanilla extract. Stir until the chocolate has melted and is smooth and shiny. Remove from heat and set to the side to cool. Once you have finished baking the cake, remove it from the oven and set to the side to cool in the pan for 10 minutes. After 10 minutes place a cooling rack on top and flip the cake, in the pan, onto the rack. Remove the pan and let cool for 1 hour. Place the cooling rack over a baking sheet and pour the ganache over the the cake, allowing the excess chocolate to run off onto the baking sheet. Mandee this cake is lovely! The ingredients say to me "rich, moist, CHOCOLATE!!!" Yum! Thanks doll! 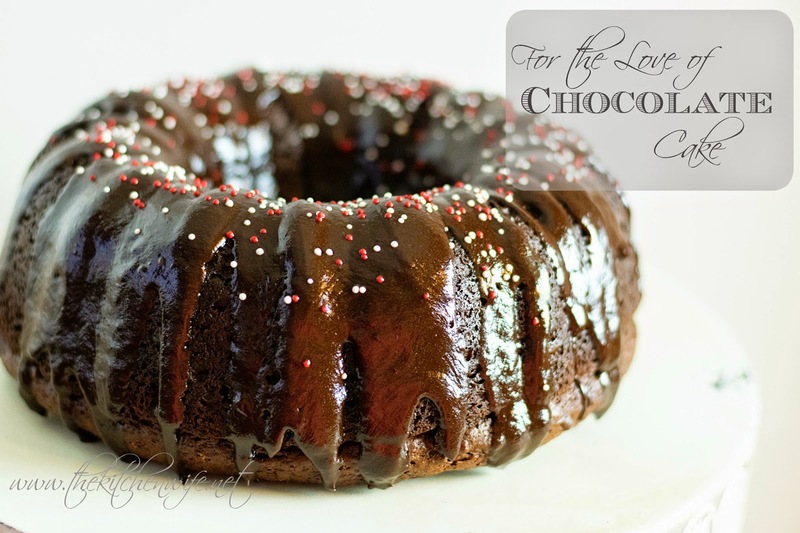 Like I said, this is not a new recipe, but it may be the best chocolate cake on the planet!